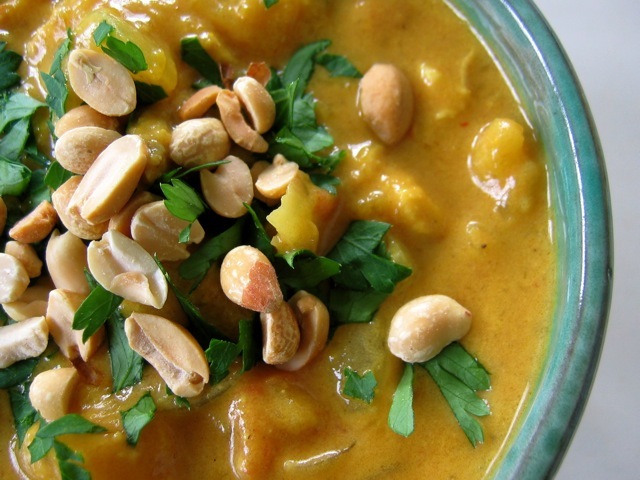 I once had a staff member from Senegal who got teary in his descriptions of peanut soup and begged me to feature it on the menu. I finally made a batch. I must have nailed the flavors and texture of this rich African comfort food, because he asked me to write the recipe for him. I adapted the recipe for the slow cooker and it has been a family favorite ever since. Brown the vegetables in small batches to ensure big flavor and appealing color and texture. The soup may be cooked two days ahead of serving and can stored, covered, in the refrigerator up to 3 days or frozen for up to 1 month. Preheat a slow cooker to low. Place a large sauté pan over medium-high heat. Lightly coat the bottom of the pan with oil. Sauté the sweet potato, squash, onions, and garlic in batches until they are browned, 5 to 7 minutes per batch. Season each batch with salt and pepper. Transfer the vegetables to the slow-cooker insert. Add the curry powder, chicken stock, tomatoes with their juices, chicken, and peanut butter to the insert. Stir to combine. Cover and cook on low for 6 hours. Stir in the coconut milk, cook long enough to heat, and adjust the seasoning with salt and pepper. Ladle the soup into bowls and add your choice of garnishes.